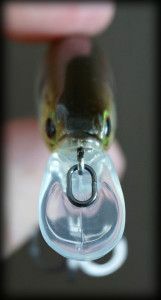 “The one that got away”; every fisherman fears it; every fisherman who has experienced it, laments it. In one moment, your dreams come alive and are simultaneously crushed, and all you are left with is a slack line and the view of a large swirl heading away from your boat. When it does happen, and after you have dragged yourself back up off the carpet of your boat’s front deck, you are left to ponder what went wrong; Did I not set the hook hard enough? Did I set it too hard and pull it to a bad spot in the fish’s mouth? Was the hook too small or too dull? Is this reel regulation size or what? We over analyze anything and everything, and we replay the 30 seconds we spent with that fish for rest of our lives. And yet, we are better fishermen for having experienced that half minute. 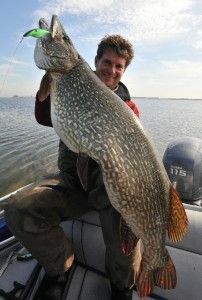 That “fish of a lifetime” is he reason we go out on the water. We never know where it may be, or what lure it will take to coax it on to the end of our line; but the mere possibility of lifting such an animal from the water makes every trip to the river worthwhile and every minute we spend looking for it time not wasted. When we are fortunate enough to have had a brush with a monster from under a dock, even if only for seconds, we climb one step closer to achieving that goal. 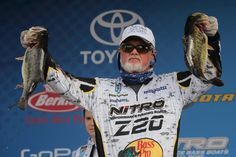 I had such a brush with the biggest bass I have ever personally seen last Saturday while fishing in the Bassmaster Weekend Series qualifier on the Potomac River, my home water. I found a small cove where I knew the bass were bedding, only the water was too stained to sight fish. I cast a wacky-rigged Yamamoto Senko to spots that I thought were likely to hold a bedding bass, and after a few casts, I hooked up with a monster in about 3-ft of water. After fighting this fish for about thirty seconds, somehow managing to keep it away from brush piles and numerous docks, I was able to bring it up to the side of my Skeeter FX20 with an anxious Co-Angler with my net in his hands. As the fish came to the surface, I was shocked by its size, color, and length, and just before she was in range of the net, she opened up her mouth, shook her head, and ran down under and to the other side of my boat. I was holding my breath at this point, for this was THE biggest bass I have ever seen. I’m sure there are plenty bigger; I’ve seen them in magazines and TV shows. This one trumped every fish I have ever seen out of the water with my own eyes. I would guess she was 8 to 10-lbs. As she ran further away to the other side of my boat, she again came to the surface, and shook her head; only this time, “pop”, and my line went slack. Dropping to my knees and burying my head in the carpet of the front deck, I asked myself all the questions, and in the end, I really can’t say why I lost her. Sometimes, they just get away. It was a privilege to have had those brief moments with her on my line. My Co-Angler, who was best I have ever fished with, both in ability and demeanor, patted my shoulder and simply said “I’m sorry. Lets go find you another”. Such a simple statement. “Go find another”. 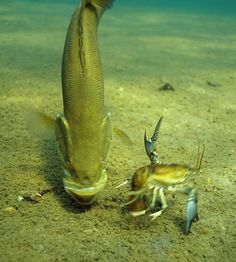 When we are unfortunate enough to lose that fish of a lifetime, we need to take a minute to learn from that experience (fish location, tide, moon phase, retrieve speed, etc. ), and then GO FIND ANOTHER. All the “what if’s” in the world wont put that fish in your live well, but they sure can distract you from the rest of your day on the water. At the start of this season, I gave myself a motto to follow, some words to keep me focused and help eliminate the distractions and emotional highs and lows that inevitably occur during a tournament: Make Every Cast Count. It was time to do just that, and go find another. We pounded away at the rest of a tough day of fishing, catching lots of short fish with each of us weighing in only one fish a piece. Mine a three-pounder. To put it in perspective, that fish would have easily won “Big Fish” for the tournament; and would have vaulted me into a top ten finish. That fish would have seen a check for well over $1000 deposited into my bank account. That fish would have been the biggest bass of my life. Instead, she is the one that got away. Chris Murphy is a Pro Angler who competes in the Bassmaster and Everstart tournament series. His lifetime passion for fishing led him to earn a Bachelor of Science in Biology from Virginia Tech, where he could “occasionally” be found fishing the New River for smallmouth rather than attending class. 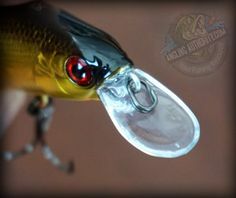 Chris loves to share information about fishing techniques, strategies, and results, and is very active in the online social fishing community. 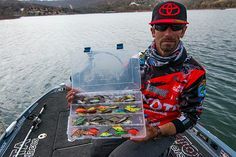 Chris’s sponsors include IMA, Optimum, Reins, Denali Rods, Angler’s Warehouse, Re-Up, Widow Wax, Vicious Fishing, Power Pole, Skeeter and Gone Fishing. Follow Chris on Facebook, Twitter and YouTube. GAMBLER LURES’ RETRO RUBBER STILL HAS THE MAGIC!